Scream! allows you to explore seismic waveforms by zooming and scaling, and also has the ability to display time series in physical units. This how-to explains the differences between these features. You can view streams at a larger or smaller zoom factor using the Vertical Zoom icons . The current zoom factor is shown between the icons. Zooming in and out only alters the scale of the display. It affects all streams in a WaveView window. If you measure a trace with Ampl Cursors, you will get the same answer at any zoom level. To apply a scaling factor to a stream, right-click on the stream and select Scale…. Enter a number, and click OK. The dialogue box gives you the opportunity to scale all streams from a digitiser at the same time, if you wish. In the picture above, the 3E75N2 stream has been scaled by a factor of 4. Scream! has added a *4 legend to the red box to remind you of the scale factor. Using the Ampl Cursors to measure the amplitude of the trace, we get an answer of 51200. For this stream, there are now 4 displayed counts to each digitiser count, and we need to divide the Ampl Cursors value by 4 to return to digitiser counts. So far, we have been displaying streams in terms of counts, as produced by the digitiser. The event shown in these examples had a maximum amplitude of 12800 counts. To be able to measure the amplitude in physical units, we need to provide Scream! with the calibration information provided with the sensor and digitiser. Right-click on the digitiser’s icon and select Calvals…. A window will open with a text entry box. This window lets you edit Scream!’s calibration values file, calvals.txt. Now fill in the text box with the calibration information. In this example, the instrument is a 3T with 30 s response, but you can use this method for any Guralp Systems sensor. The page Information blocks describes the format of the calibration values. The first line is the System ID and Stream ID prefix for the digitiser, separated by a hyphen -. They are contained in square brackets: [GURALP-3E75]. The details for each instrument follow a header line, which Scream! can then use to retrieve the correct details for each instrument you have entered information for. When you have filled in the values, click OK.
Any WaveView windows that are open will change to show streams in physical units. New WaveView windows will also use these units where possible. We see that the maximum ground velocity during this event was around 37900 nm/s. To change the unit used, choose File → Setup… from the main menu and switch to the Display tab. Select the physical unit required from one of the Units drop-down boxes. Streams from accelerometers can be scaled to physical units using the same technique. Initially, Scream! displays traces on a scale of digitiser counts, as for velocity instruments. To input calibration values, you can right-click on the digitiser and use the Calvals… window as above. Alternatively, you can edit the calvals.txt file directly. This file is kept in Scream!’s normal directory. It contains information about every sensor known to Scream!. Each section begins with the sensor IDs in square brackets. To add a new sensor, enter its details at the end of the file. For accelerometers, the calibration sheet includes the values you will need for G. VPC is on the digitiser calibration sheet as before. TYPE and RESPONSE should be filled in as for a velocity sensor (although of course the response units will now be Acc). If you edit calvals.txt by hand, you will need to delete streams from any WaveView windows that are affected, then drag the streams back in. This event is now displayed in units of mm/s2. Using the Ampl Cursors we can estimate that the peak acceleration during the event was 71 mm/s2. 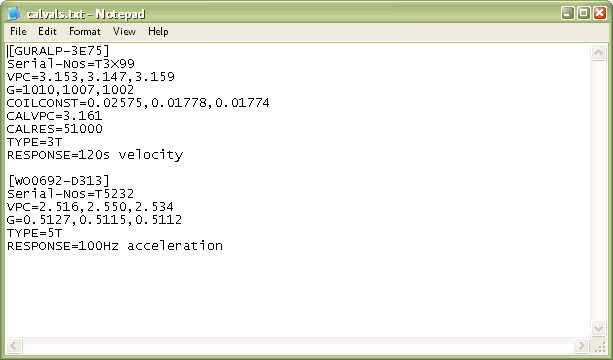 To change the unit of acceleration used, choose File → Setup… from the main menu and select a unit from the drop-down boxes on the Display tab. Scream! detects whether you have a displacement, velocity, or acceleration sensor from the RESPONSE line in the calvals file. When Scream! displays a stream in physical units, what it actually does is work out the scale factor for the stream that will make 1 displayed count equal 1 nm/s, or 1 mm/s2, or whichever physical unit you have configured for that type of sensor. It then applies this scale factor to the stream. If you right-click on a stream which is being displayed in physical units and choose Scale…, you will see the scale factor currently in use. Scream! has combined the sensor sensitivity G with the digitiser sensitivity VPC to give an overall scale of 3.125 nm/s per (digitiser) count. If you edit this value, Scream! will go back to displaying the scale factor as a number (*4, etc.) If you set it to 1, Scream! will go back to displaying the stream in digitiser counts. 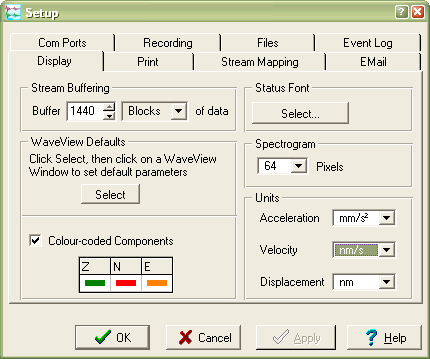 To return to physical units, delete the stream from the WaveView window and drag it back in from the main window. Scream does not correct for the frequency response of either the sensor or the digitiser. 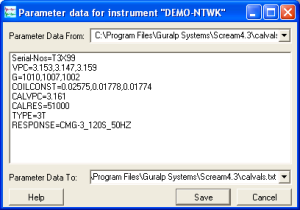 The physical values displayed in the WaveView window are only valid within the passband of the instrument. This is not normally a problem for accelerometers, but velocity time series may need to be filtered before you can estimate ground movement. 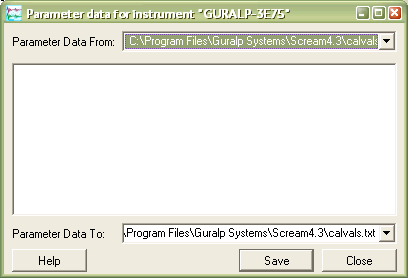 To obtain true corrected time series, you can use Guralp Systems’ ART analysis tool, provided with Scream! or available from our software section.